Modern vehicles have electronic control units (ECUs) to control various subsystems such as the engine, brakes, steering, air conditioning, and infotainment. These ECUs (or simply ‘controllers’) are networked together to share information, and output directly measured and calculated data to each other. This in-vehicle network is a data goldmine for improved maintenance, measuring vehicle performance and its subsystems, fleet management, warranty and legal issues, reliability, durability, and accident reconstruction. The focus of Data Acquisition from HD Vehicles Using J1939 CAN Bus is to guide the reader on how to acquire and correctly interpret data from the in-vehicle network of heavy-duty (HD) vehicles. The reader will learn how to convert messages to scaled engineering parameters, and how to determine the available parameters on HD vehicles, along with their accuracy and update rate. Written by two specialists in this field, Richard (Rick) P. Walter and Eric P. Walter, principals at HEM Data, located in the United States, the book provides a unique road map for the data acquisition user. The authors give a clear and concise description of the CAN protocol plus a review of all 19 parts of the SAE International J1939 standard family. Pertinent standards are illuminated with tables, graphs and examples. Practical applications covered are calculating fuel economy, duty cycle analysis, and capturing intermittent faults. A comparison is made of various diagnostic approaches including OBD-II, HD-OBD and World Wide Harmonized (WWH) OBD. Data Acquisition from HD Vehicles Using J1939 CAN Bus is a must-have reference for those interested to acquire data effectively from the SAE J1939 equipped vehicles. 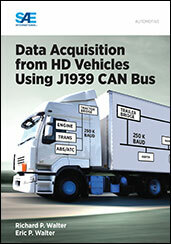 If you do not have access to SAE MOBILUS via username/password or institutional access, you can still purchase the Book, Data Acquisition from HD Vehicles Using J1939 CAN Bus.